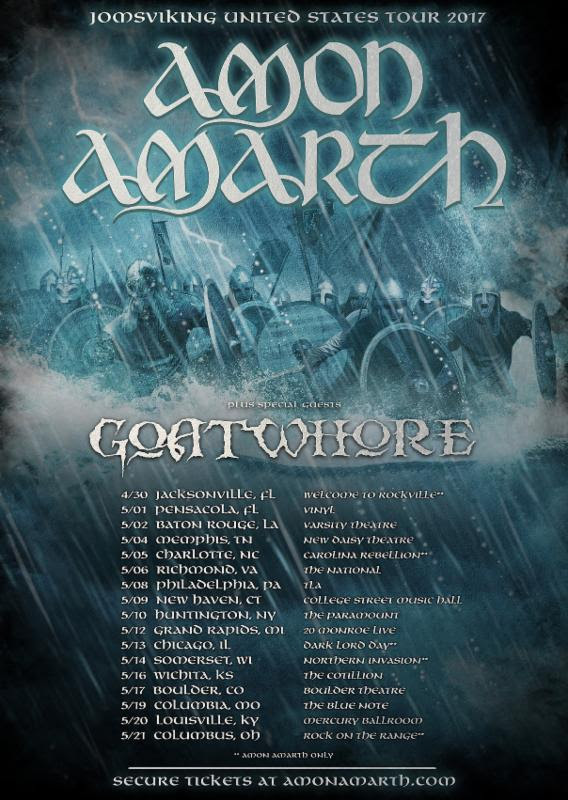 After touring the world this past year in support of their latest album, Jomsviking, AMON AMARTH will head back out on the road this spring for a US tour with labelmates Goatwhore! Starting April 30th and running through May 21st, the journey will also see AMON AMARTH making appearances at some of the country’s premier music festivals including: Welcome To Rockville, Carolina Rebellion, Dark Lord Day, Northern Invasion, and Rock On The Range. As the band’s first concept record in their storied career, Jomsviking tells a tragic, original tale of conflict and revenge, backed by the Swedes’ trademark melodic, anthemic metal – which was produced and mixed once again by Andy Sneap (Megadeth, Testament, Accept). For their efforts, AMON AMARTH landed on the global charts this past year including a #11 spot on the USA Current Album Billboard Chart. 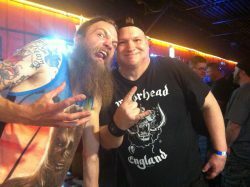 To purchase and preview Jomsviking, please visit amonamarth.com. 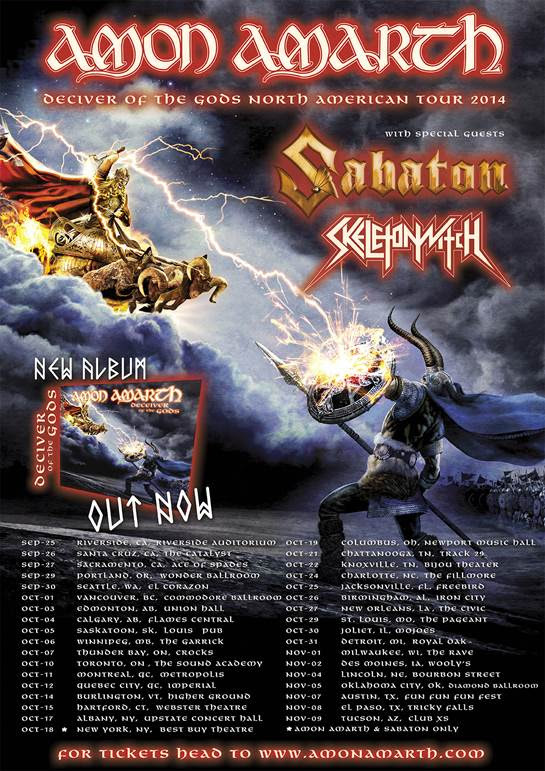 This September and October, Swedish Metal kings AMON AMARTH will return to the US as direct support to Megadeth! The tour, which runs from September 20th through October 16th, will also include Suicidal Tendencies, Metal Church, and Havok. During the journey, AMON AMARTH will also join the likes of Slipknot, Slayer, Anthrax and more on Sunday, September 25th as part of the annual Knotfest. See all confirmed dates below. AMON AMARTH will be touring in support of their recently released Jomsviking full-length. As the band’s first concept record in their storied career, Jomsviking – which was produced and mixed again by Andy Sneap (Megadeth, Testament, Accept) – tells a tragic, original tale of conflict and revenge, backed by the Swedes’ trademark melodic, anthemic Metal. The record landed on the global charts – including a #11 spot on the US Current Album Billboard Chart! To purchase and preview Jomsviking, visit amonamarth.com, where the record is available in various formats and the videos for “At Dawn’s First Light” and “First Kill” can be viewed. On This Day In METAL History – May 4th… AMON AMARTH Edition! On May 4th, 2016 – AMON AMARTH are to perform at The Pageant in Saint Louis, Missouri, USA. Hail AMON AMARTH! On May 4th, 2016 – AMON AMARTH have their tenth studio album, Jomsviking, ranked at #8 on the iTunes Top 100 Heavy Metal Albums Chart. On May 4th, 2016 – AMON AMARTH have their ninth studio album, Deceiver Of The Gods, ranked at #68 on the iTunes Top 100 Heavy Metal Albums Chart. Dig it. This album was released back in 2013. On May 4th, 2016 – AMON AMARTH have their eighth studio album, Surtur Rising, ranked at #71 on the iTunes Top 100 Heavy Metal Albums Chart. This album was released back in 2011. On May 4th, 2016 – AMON AMARTH have their seventh studio album, Twilight Of The Thundergod, ranked at #72 on the iTunes Top 100 Heavy Metal Albums Chart. This album was released back in 2008. On This Day In METAL History – March 25th, 2016: Global Record Release Day! 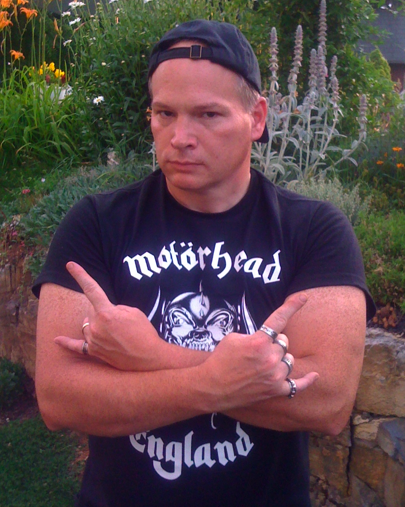 From METAL CHURCH To AMON AMARTH! On March 25th, 2016 – The mighty AMON AMARTH releases their tenth studio album: Jomsviking. Whoa! I’m buying this CD, my fellow Metal brethren!! Um… Jomsviking is currently ranked at #2, on the iTunes Top 100 Heavy Metal Albums Chart. HAIL AMON AMARTH!! On March 25th, 2016 – The Metal warriors aka METAL CHURCH releases their eleventh studio album, via Rat Pak Records, aptly titled: XI. I’m buying this CD too, man!! Hey… XI is currently ranked at #3, on the iTunes Top 100 Heavy Metal Albums Chart. Whoa. On March 25th, 2016 – The valiant JUDAS PRIEST releases their live CD/DVD: Battle Cry. Yeah!! I’m gonna buy this Metal prize today!! LONG LIVE JUDAS PRIEST!! On March 25th, 2016 – Denmark’s Thrash/Speed Metal legion aka ARTILLERY releases their new studio album, via Metal Blade Records: Penalty By Perception. I will buy this CD soon, cuz $$ don’t grow on Metal trees, you know? In other Metal words, Artillery is on my Metal list! Whoa. By the way, Artillery is ranked at #76, on the iTunes Top 100 Heavy Metal Albums Chart. Dig it. On March 25th, 2016 – The fourth studio album, The Black, from England’s ASKING ALEXANDRIA is ranked at #1, on the iTunes Top 100 Heavy Metal Albums Chart. This album also releases today, via Sumerian Records. Dig it. I’ll say this much, that is one freaking creepy album cover for The Black. Damn. I’ll probably wait to get this CD at a used price someday. There are loads more Metal albums being released today, I just cannot possibly list them all cuz I have to water my daisies, finish knitting an ABBA banner and play checkers with my two cats. You know? The tour will follow the release of AMON AMARTH‘s tenth studio album, Jomsviking, set for unveiling in North America via Metal Blade Records on March 25th. Jomsviking – the band’s first concept record in their storied career – tells a tragic tale of love and revenge, backed by the Swedes’ trademark melodic, anthemic Metal, which was produced and mixed once again by Andy Sneap (Megadeth, Testament, Accept) and also features special guest session drummer Tobias Gustafsson (Vomitory). The epic original story is set in the world of the Jomsvikings, the legendary order of mercenary Vikings. By far their most ambitious project to date, Jomsviking is available for preorder in various formats now at AmonAmarth.com where fans can also view the video for the album’s first single, First Kill. Produced by Grupa 13 and directed by Darek Szermanowicz (Behemoth), First Kill was filmed in Gohrweide, Germany and Warsaw, Poland and features a cinematic depiction of the violent, brutal lyrics, along with powerful live footage of the band performing with their full dragon head and pyro stage-set. Johan Hegg will be spinning First Kill and his own playlist at two public appearances in New York City and Los Angeles: the NYC event will be held at Saint Vitus Bar in Brooklyn on February 2nd at 9:00PM, while the LA event will be held at Grill ‘Em All in Alhambra on February 9th at 5:00PM. Critically acclaimed, Billboard-charting metal unit, AMON AMARTH, will be reconquering North America this Fall. This time around, the band will bring fellow Swedes, Sabaton, along for the ride. Additionally, Skeletonwitch will once again be opening the show, with the exception of New York City where fans will be treated to the first-ever North American performance from extreme metal supergroup, Vallenfyre as part of the Decibel Magazine 10th anniversary celebrations (which will include additional news and events to be announced soon). In February of this year, AMON AMARTH devotees in Los Angeles witnessed the exclusive appearance of the band’s epic Viking ship stage setup. For this tour, New York enthusiasts will take in the Viking ship spectacle at the Best Buy Theatre on October 18th. Tickets will go on sale on May 30th. 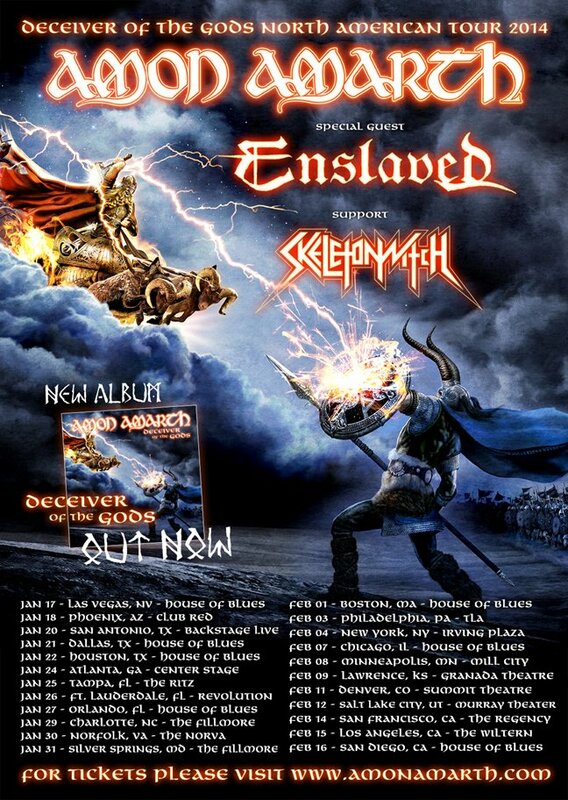 Keep an eye on amonamarth.com/tour for details. 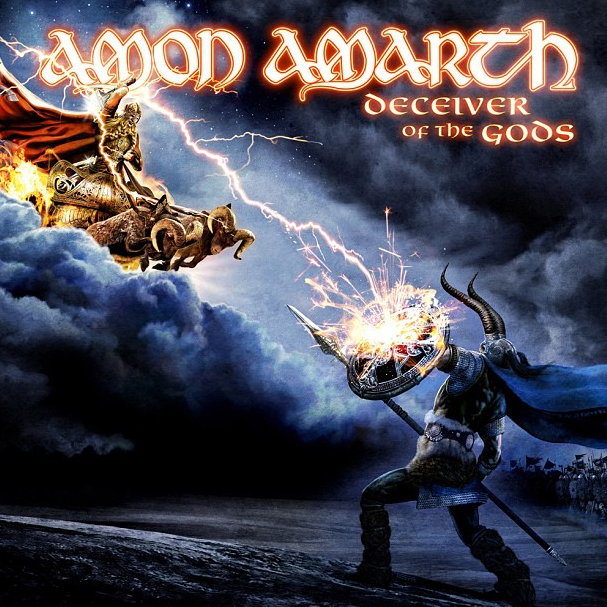 AMON AMARTH’s latest full-length, Deceiver Of The Gods, was released in June of 2013. The album debuted at #19 on the Billboard Top 200 chart, making it the band’s highest-charting album to date. Check out music as well as the epic video for “Father Of The Wolf” at THIS LOCATION. 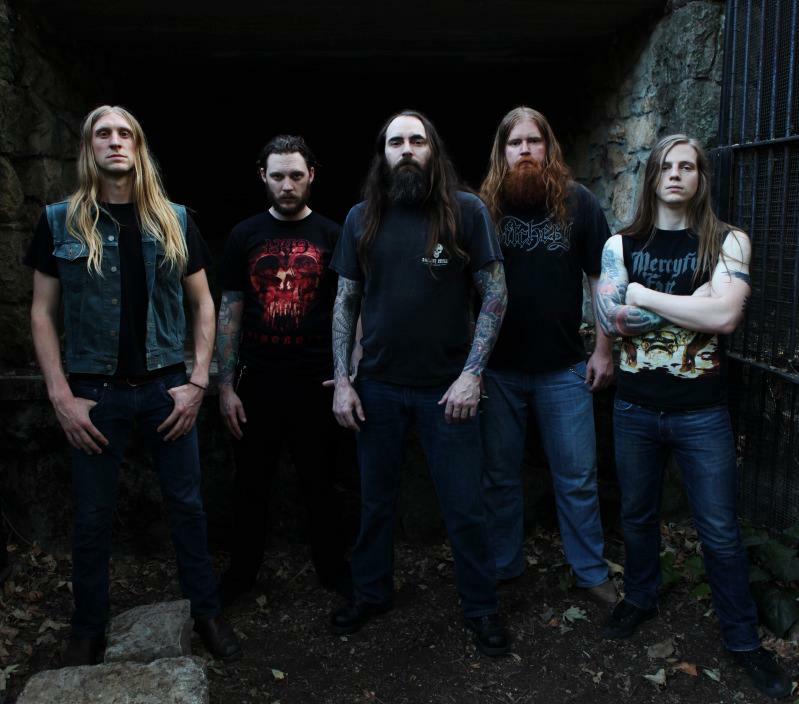 SKELETONWITCH – Although their busy Fall itinerary (which includes tours alongside Ghost B.C. and The Black Dahlia Murder) is their immediate focus, Blackened Metal heathens SKELETONWITCH are already looking ahead to 2014 with a massive month-long trek alongside Amon Amarth and Enslaved that will take the Ohio quintet to many markets they will not hit during their Autumn takeover. Tickets go on sale this Friday. Find a complete list of the group’s upcoming concerts below. Last month, SKELETONWITCH unveiled “Burned From Bone,” the first taste of the their highly anticipated new album, Serpents Unleashed. You can still text SERPENTS to 24587 to obtain a free download of the track. Recorded with Kurt Ballou (Converge, Isis, Kvelertak) earlier this year, Serpents Unleashed — which will come available in CD, LP, cassette, digital download and limited edition 7-inch collector’s box formats — will be unleashed in North America on October 29th, in Australia, Germany, Austria and Switzerland on October 25th and in the UK and the rest of Europe onOctober 28th. Check out parts one and two in a series of Serpents Unleashed making-of webisodes HERE and HERE. And if you’re jonesing for more, another new tune from Serpents Unleashed — hailed by Decibel as the band’s “best effort to date” — will premiere on Liquid Metal with Jose on SiriusXM channel 40 today between 3:00:PM – 9:00PM EST. Additionally, the world premiere of the group’s newest music video will take place tomorrow! Stay tuned for details.